For example, I might want to list the 'n' highest or lowest recent order values per customer. Same again, but with n history lines per product, where n is five times the DaysToManufacture Product attribute. Let's start with the basic scenario. This returns 418 rows, and the plan shows that it checks every row in the table looking for this - an unrestricted Clustered Index Scan, with a Predicate to provide the filter. 797 reads here, which is ugly. So let's be fair to it, and create an index that would be more useful. Our conditions call for an equality match on ProductID, followed by a search for the most recent by TransactionDate. We need the TransactionID returned too, so let's go with: CREATE INDEX ix_FindingMostRecent ON Production.TransactionHistory (ProductID, TransactionDate) INCLUDE (TransactionID);. Now that we've levelled the playing field, let's look at the top options - ranking functions and TOP. You will notice that the second (TOP) query is much simpler than the first, both in query and in plan. But very significantly, they both use TOP to limit the number of rows actually being pulled out of the index. The costs are only estimates and worth ignoring, but you can see a lot of similarity in the two plans, with the ROW_NUMBER() version doing a tiny amount of extra work to assign numbers and filter accordingly, and both queries end up doing just 2 reads to do their work. The Query Optimizer certainly recognises the idea of filtering on a ROW_NUMBER() field, realising that it can use a Top operator to ignore rows that aren't going to be needed. Both these queries are good enough - TOP isn't so much better that it's worth changing code, but it is simpler and probably clearer for beginners. The iterative programmer is going to consider the idea of looping through the products of interest, and calling this query multiple times, and we can actually get away with writing a query in this form - not using cursors, but using APPLY. I'm using OUTER APPLY, figuring that we might want to return the Product with NULL, if there are no Transactions for it. The plan for this is the iterative programmers' method - Nested Loop, doing a Top operation and Seek (those 2 reads we had before) for each Product. This gives 4 reads against Product, and 360 against TransactionHistory. Significantly, though, this plan has an expensive Sort operator. The Merge Join doesn't seem to maintain the order of rows in TransactionHistory, the data must be resorted to be able to find the rownumbers. It's fewer reads, but this blocking Sort could feel painful. Using APPLY, the Nested Loop will return the first rows very quickly, after just a few reads, but with a Sort, ROW_NUMBER() will only return rows after a most of the work has been finished. This plan uses a Nested Loop, just like with APPLY. But there's no Top operator, so it pulls all the transactions for each product, and uses a lot more reads than before - 492 reads against TransactionHistory. There isn't a good reason for it not to choose the Merge Join option here, so I guess the plan was considered 'Good Enough'. Still - it doesn't block, which is nice - just not as nice as APPLY. But the Join operator says 'Left Outer Join' instead of 'Inner Join'. The number of reads is still just under 500 reads against the TransactionHistory table. We've answered question 1, with two options that you could pick and choose from. Personally, I like the APPLY option. One way to avoid the block is to come up with a plan that handles the ROW_NUMBER() bit to the right (in the plan) of the join. We can persuade this to happen by doing the join outside the CTE. The plan here looks simpler - it's not blocking, but there's a hidden danger. Notice the Compute Scalar that's pulling data from the Product table. This is working out the 5 * p.DaysToManufacture value. This value isn't being passed into the branch that's pulling data from the TransactionHistory table, it's being used in the Merge Join. As a Residual. So the Merge Join is consuming ALL the rows, not just the first however-many-are-needed, but all of them and then doing a residual check. This is dangerous as the number of transactions increases. I'm not a fan of this scenario - residual predicates in Merge Joins can quickly escalate. Another reason why I prefer the APPLY/TOP scenario. In the special case where it's exactly one row, for question 3, we can obviously use the same queries, but with 1 instead of 5. But then we have an extra option, which is to use regular aggregates. A query like this would be a useful start, and we could easily modify it to pull out the TransactionID as well for tie-break purposes (using a concatenation which would then be broken down), but we either look at the whole index, or we dive in product by product, and we don't really get a big improvement on what we had before in this scenario. But I should point out that we're looking at a particular scenario here. With real data, and with an indexing strategy that may not be ideal, mileage may vary considerably. Despite the fact that we've seen that APPLY is strong here, it can be slower in some situations. It rarely blocks though, as it has a tendency to use Nested Loops, which many people (myself included) find very appealing. I haven't tried to explore parallelism here, or dived very hard into question 3, which I see as a special case that people rarely want based on the complication of concatenating and splitting. The main thing to consider here is that these two options are both very strong. I prefer APPLY. It's clear, it uses the Top operator well, and it rarely causes blocking. Note that these will perform differently depending on data distribution and the availability of supporting indexes, so optimizing the performance and getting the best plan will really depend on local factors. Personally, I prefer the CTE and windowing solutions over the CROSS APPLY / TOP because they separate the logic better and are more intuitive (to me). In general (both in this case and in my general experience), the CTE approach produces more efficient plans (examples below), but this should not be taken as a universal truth - you should always test your scenarios, especially if indexes have changed or data has skewed significantly. Again, minor changes here. In the CTE solution, we add TransactionID to the OVER() clause, and change the outer filter to rn = 1. For the CROSS APPLY, we change the TOP to TOP (1), and add TransactionID to the inner ORDER BY. Windowing functions aren't always the best alternative (have a go at COUNT(*) OVER()), and these are not the only two approaches to solving the n rows per group problem, but in this specific case - given the schema, existing indexes, and data distribution - the CTE fared better by all meaningful accounts. If this were my production environment, I'd probably be satisfied with the duration in this case, and wouldn't bother to optimize further. This was all much uglier in SQL Server 2000, which didn't support APPLY or the OVER() clause. Note: In MySQL, instead of AND o.OrderID IN (SELECT TOP(@top) oi.OrderID ...) one would use AND o.OrderDate >= (SELECT oi.OrderDate ... LIMIT 1 OFFSET (@top - 1)). SQL-Server added FETCH / OFFSET syntax in 2012 version. The queries here were adjusted with IN (TOP...) to work with earlier versions. I took a slightly different approach, mainly to see how this technique would compare to the others, because having options is good, right? The second set ran after an index was created to support TransactionDate-based queries against Production.TransactionHistory. The third set made a slightly different assumption. Since all three tests ran against the same list of Products, what if we cached that list? My method uses an in-memory cache while the other methods used an equivalent temp table. The supporting index created for the second set of tests still exists for this set of tests. The tests were run against AdventureWorks2012 on SQL Server 2012, SP2 (Developer Edition). For each test I labeled whose answer I took the query from and which particular query it was. I used the "Discard results after execution" option of Query Options | Results. Please note that for the first two sets of tests, the RowCounts appear to be "off" for my method. This is due my method being a manual implementation of what CROSS APPLY is doing: it runs the initial query against Production.Product and gets 161 rows back, which it then uses for the queries against Production.TransactionHistory. Hence, the RowCount values for my entries are always 161 more than the other entries. In the third set of tests (with caching) the row counts are the same for all methods. 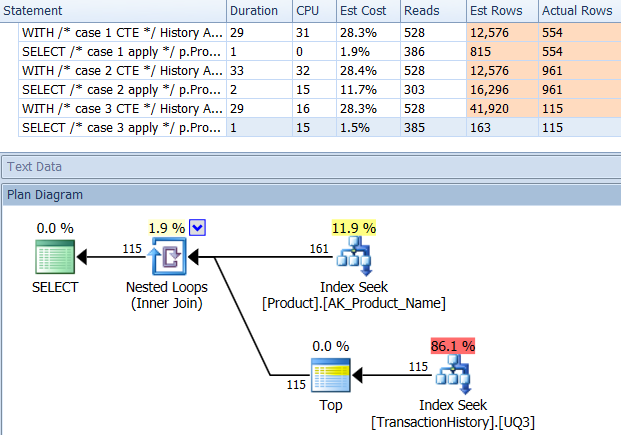 I used SQL Server Profiler to capture the stats instead of relying on the execution plans. Aaron and Mikael already did a great job showing the plans for their queries and there is no need to reproduce that information. And the intent of my method is to reduce the queries to such a simple form that it wouldn't really matter. There is an additional reason for using Profiler, but that will be mentioned later. Rather than using the Name >= N'M' AND Name < N'S' construct, I chose to use Name LIKE N'[M-R]%', and SQL Server treats them the same. This is essentially out-of-the-box AdventureWorks2012. In all cases my method is clearly better than some of the other, but never as good as the top 1 or 2 methods. Aaron's CTE is clearly the winner here. Aaron's CTE (again) and Mikael's second apply row_number() method is a close second. Aaron's CTE (again) is the winner. When there is no supporting index on TransactionDate, my method is better than doing a standard CROSS APPLY, but still, using the CTE method is clearly the way to go. Once this index is in place, the results change quite a bit. This time it is my method that comes out ahead, at least in terms of Logical Reads. The CROSS APPLY method, previously the worst performer for Test 1, wins on Duration and even beats the CTE method on Logical Reads. This time it is Mikael's first apply row_number() method that is the winner when looking at Reads, whereas previously it was one of the worst performers. And now my method comes in at a very close second place when looking at Reads. In fact, outside of the CTE method, the rest are all fairly close in terms of Reads. Here the CTE is still the winner, but now the difference between the other methods is barely noticeable compared to the drastic difference that existed prior to creating the index. The applicability of my method is more apparent now, though it is less resilient to not having proper indexes in place. For this set of tests I made use of caching because, well, why not? My method allows for using in-memory caching that the other methods cannot access. So to be fair, I created the following temp table that was used in place of Product.Product for all references in those other methods across all three tests. The DaysToManufacture field is only used in Test Number 2, but it was easier to be consistent across the SQL scripts to use the same table and it didn't hurt to have it there. All methods seem to benefit equally from caching, and my method still comes out ahead. Here we now see a difference in the lineup as my method comes out barely ahead, only 2 Reads better than Mikael's first apply row_number() method, whereas without the caching my method was behind by 4 Reads. Please see update towards the bottom (below the line). Here we again see some difference. The "parameterized" flavor of my method is now barely in the lead by 2 Reads compared to Aaron's CROSS APPLY method (with no caching they were equal). But the really strange thing is that for the first time we see a method that is negatively affected by the caching: Aaron's CTE method (which was previously the best for Test Number 3). But, I am not going to take credit where it is not due, and since without the caching Aaron's CTE method is still faster than my method is here with the caching, the best approach for this particular situation appears to be Aaron's CTE method. Situations that make repeated use of the results of a secondary query can often (but not always) benefit from caching those results. But when caching is a benefit, using memory for said caching has some advantage over using temporary tables. I separated the "header" query (i.e. getting the ProductIDs, and in one case also the DaysToManufacture, based on the Name starting with certain letters) from the "detail" queries (i.e. getting the TransactionIDs and TransactionDates). The concept was to perform very simple queries and not allow the optimizer to get confused when JOINing them. Clearly this is not always advantageous as it also disallows the optimizer from, well, optimizing. But as we saw in the results, depending on the type of query, this method does have its merits. Constants: Submit any replaceable values as inline constants instead of being parameters. This would refer to ProductID in all three tests and also the number of rows to return in Test 2 as that is a function of "five times the DaysToManufacture Product attribute". This sub-method means that each ProductID will get its own execution plan, which can be beneficial if there is a wide variation in data distribution for ProductID. But if there is little variation in the data distribution, the cost of generating the additional plans will likely not be worth it. Parameterized: Submit at least ProductID as @ProductID, allowing for execution plan caching and reuse. There is an additional test option to also treat the variable number of rows to return for Test 2 as a parameter. Optimize Unknown: When referencing ProductID as @ProductID, if there is wide variation of data distribution then it is possible to cache a plan that has a negative effect on other ProductID values so it would be good to know if using this Query Hint helps any. Cache Products: Rather than querying the Production.Product table each time, only to get the exact same list, run the query once (and while we are at it, filter out any ProductIDs that aren't even in the TransactionHistory table so we don't waste any resources there) and cache that list. The list should include the DaysToManufacture field. Using this option there is a slightly higher initial hit on Logical Reads for the first execution, but after that it is only the TransactionHistory table that is queried. Ok, but so, um, how is it possible to issue all of the sub-queries as separate queries without using a CURSOR and dumping each result set to a temporary table or table variable? Clearly doing the CURSOR / Temp Table method would reflect quite obviously in the Reads and Writes. Well, by using SQLCLR :). By creating a SQLCLR stored procedure, I was able to open a result set and essentially stream the results of each sub-query to it, as a continuous result set (and not multiple result sets). Outside of the Product information (i.e. ProductID, Name, and DaysToManufacture), none of the sub-query results had to be stored anywhere (memory or disk) and just got passed through as the main result set of the SQLCLR stored procedure. This allowed me to do a simple query to get the Product info and then cycle through it, issuing very simple queries against TransactionHistory. And, this is why I had to use SQL Server Profiler to capture the statistics. The SQLCLR stored procedure did not return an execution plan, either by setting the "Include Actual Execution Plan" Query Option, or by issuing SET STATISTICS XML ON;. For the Product Info caching, I used a readonly static Generic List (i.e. _GlobalProducts in the code below). It seems that adding to collections does not violate the readonly option, hence this code works when the assembly has a PERMISSON_SET of SAFE :), even if that is counter-intuitive. There is not enough room to post the tests here so I will find another location. For certain scenarios, SQLCLR can be used to manipulate certain aspects of queries that cannot be done in T-SQL. And there is the ability to use memory for caching instead of temp tables, though that should be done sparingly and carefully as the memory does not get automatically released back to the system. This method is also not something that will help ad hoc queries, though it is possible to make it more flexible than I have shown here simply by adding parameters to tailor more aspects of the queries being executed. I had decided at the time to forgo including TransactionId DESC at the end, figuring that while it might help Test Number 3 (which specifies tie-breaking on the most recent TransactionId--well, "most recent" is assumed since not explicitly stated, but everyone seems to agree on this assumption), there likely wouldn't be enough ties to make a difference. But, then Aaron retested with a supporting index that did include TransactionId DESC and found that the CROSS APPLY method was the winner across all three tests. This was different than my testing which indicated that the CTE method was best for Test Number 3 (when no caching was used, which mirrors Aaron's test). It was clear that there was an additional variation that needed to be tested. The above results are for the standard, non-caching test. This time, not only does the CROSS APPLY beat the CTE (just as Aaron's test indicated), but the SQLCLR proc took the lead by 30 Reads (woo hoo). The above results are for the test with caching enabled. This time the CTE's performance is not degraded, though the CROSS APPLY still beats it. However, now the SQLCLR proc takes the lead by 23 Reads (woo hoo, again). There are various options to use. It is best to try several as they each have their strengths. The tests done here show a rather small variance in both Reads and Duration between the best and worst performers across all tests (with a supporting index); the variation in Reads is about 350 and Duration is 55 ms. While the SQLCLR proc did win in all but 1 test (in terms of Reads), only saving a few Reads usually isn't worth the maintenance cost of going the SQLCLR route. But in AdventureWorks2012, the Product table has only 504 rows and TransactionHistory has only 113,443 rows. The performance difference across these methods probably becomes more pronounced as the row counts increase. While this question was specific to getting a particular set of rows, it should not be overlooked that the single biggest factor in performance was indexing and not the particular SQL. A good index needs to be in place before determining which method is truly best. The most important lesson found here is not about CROSS APPLY vs CTE vs SQLCLR: it's about TESTING. Don't assume. Get ideas from several people and test as many scenarios as you can. APPLY TOP or ROW_NUMBER()? What could there possibly be more to say on that matter? A short recap of the differences and to really keep it short I will only show the plans for option 2 and I have added the index on Production.TransactionHistory. The main difference between these are that apply top filters on the top expression below the nested loops join where row_number version filters after the join. That means there are more reads from Production.TransactionHistory than really is necessary. If there only existed a way to push the operators responsible for enumerating rows down to the lower branch before the join then row_number version might do better. So enter apply row_number() version. As you can see apply row_number() is pretty much the same as apply top only slightly more complicated. Execution time is also about the same or bit slower. So why did I bother to come up with an answer that is no better than what we already have? Well, you have one more thing to try out in the real world and there actually is a difference in reads. One that I don't have an explanation for*. Table 'TransactionHistory'. Scan count 115, logical reads 230, physical reads 0, read-ahead reads 0, lob logical reads 0, lob physical reads 0, lob read-ahead reads 0. Table 'TransactionHistory'. Scan count 115, logical reads 268, physical reads 0, read-ahead reads 0, lob logical reads 0, lob physical reads 0, lob read-ahead reads 0. While I'm at it i might as well throw in a second row_number() version that in certain cases might be the way to go. Those certain cases would be when you expect you actually need most of the rows from Production.TransactionHistory because here you get a merge join between Production.Product and the enumerated Production.TransactionHistory. To get the above shape without a sort operator you also have to change the supporting index to order by TransactionDate descending. --You can change the following field or sort order to whatever you'd like to order by. Not the answer you're looking for? Browse other questions tagged sql-server t-sql greatest-n-per-group or ask your own question. SQL Server SELECT column not in Group By clause? How to get top 5 rows of given Id? How to manage 3.1 billion rows of data?